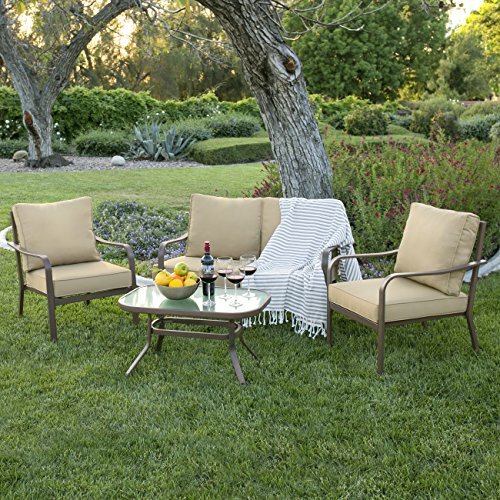 Take a seat and relax for a while with this 4-piece conversation set. Perfect for a poolside setup, patios, gardens, and more, this outdoor furniture effortlessly embodies versatility. Designed to last throughout the years, it comes complete with an easy-to-clean glass top coffee table and water-resistant polyester cushions. Invite friends or family over and show off this classy upgrade to your outdoor living space. Table Weight Capacity: 110 lbs. Loveseat Weight Capacity: 500 lbs. Chair Weight Capacity (Each): 250 lbs. Table Dimensions: 32"(L) x 20" "(W) x 18"(H); Chair Weight Capacity (each): 250 lbs.